This week we have a guest post from Bernhard Baumrock that is a nice introduction to creating Process modules in ProcessWire. Bernhard covers a lot of useful material here and we hope you enjoy it. Big thanks to him for his contribution this week. While there's a lot here, there's actually a few more things to cover too (like use of separate view files) so we may cover those in a Part 2 at some point in the near future as well. For more about Bernhard, check out his website at baumrock.com. I've been traveling (Ryan) but arrived back in town last night, so next week we'll be back to our regular PW core updates and schedule. 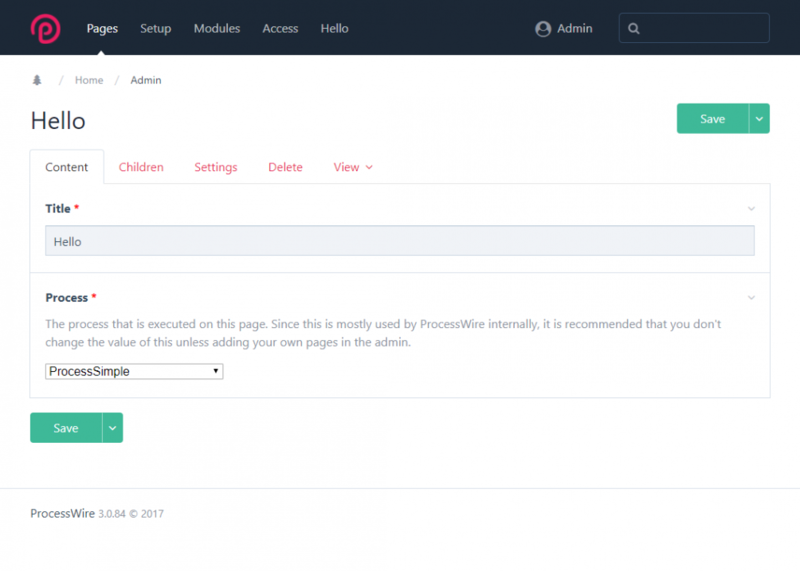 The intention of this article is the same as the one from my forum tutorial: I want to show how easy it is to create your own pages in the PW admin, how you can use PW's components and include external scripts. And finally, I want to show that you don't have to be afraid of looking into the code of the core to look for documentation that is not listed in the PW docs. For this tutorial I'm using a clean PW 3.0.84 installation with the default profile. If you want to follow the examples I recommend you try it with the same setup so that you can use my code without any modifications. The code of all examples is available in this gitlab repository. 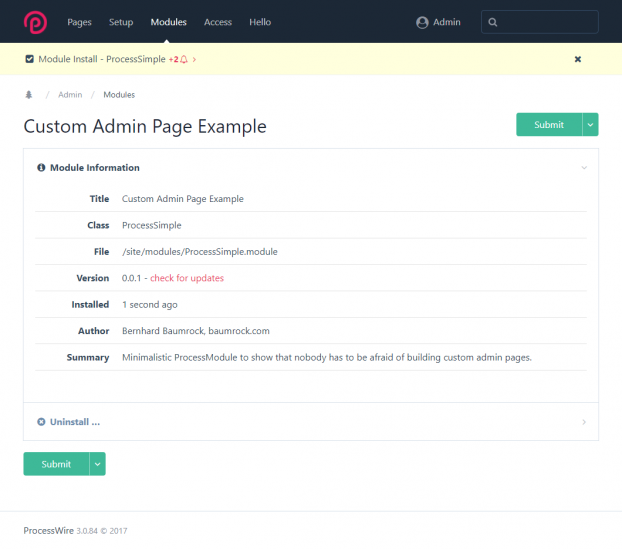 I'm sure everybody is eager to write their first custom backend page, so we will start with the most basic module possible and explain what's happening later on. This step might be easier than you have ever thought — it's just a matter of placing one file (with very little code) in the right place and giving it the correct name. Side note: the 3 underscores "___" preceding the method name "execute" are optional. Whenever a method in ProcessWire is preceded with 3 underscores, it becomes hookable. Should you call the method from your own code, you would call it without the underscores and ProcessWire takes care of the rest. In the case of the example above, if the method was named execute() rather than ___execute(), it would still work the same in our examples here, but just would not be hookable by other modules. 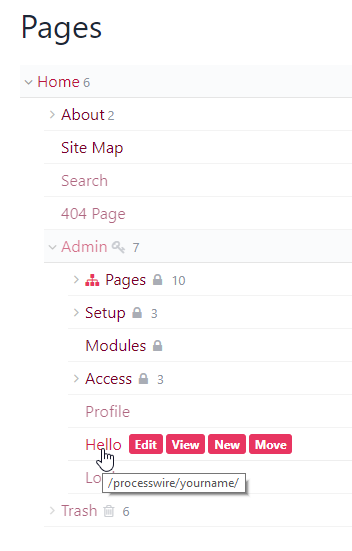 What happened behind the scenes is that ProcessWire created a page for us under the parent /processwire/ (or whatever the admin page is named) using the template admin. 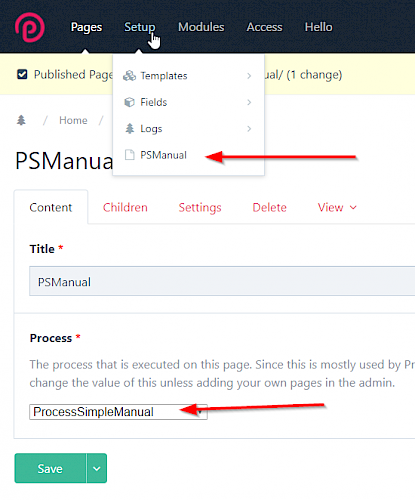 Every page having the admin template executes a specified Process module. 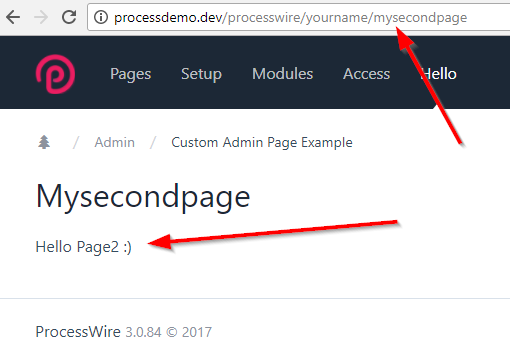 And that's what we did: We created a Process module that returns "Hello World :)", and we assigned that Process to our newly created page in the admin. 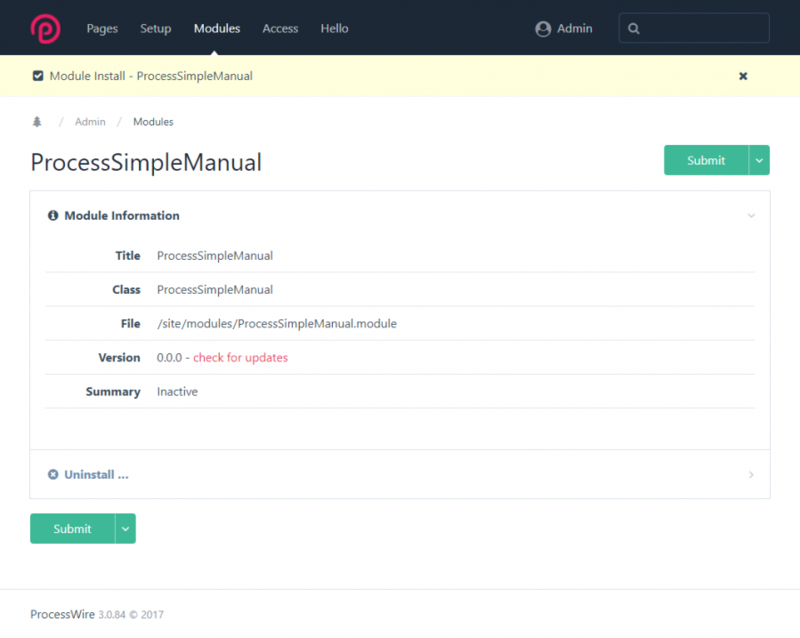 Notice that we also changed the name of the class to "ProcessSimpleManual" instead of "ProcessSimple". The name of the file and the name of the class always have to correspond! We can even install this module! So you may ask what is the difference relative to the first version (that had more code)? If you look at the screenshot above you may notice that some information is missing, like the summary of the module. And if you look at the menu you'll see that there is no page for that module. That's intended for this example because we want to take the steps manually. But in real life development of course it would be better to take the first route. 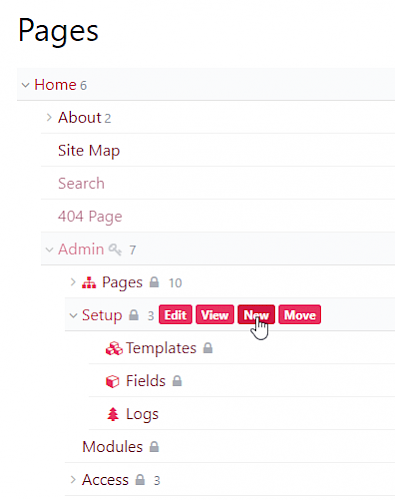 Well done—you now know how to create basic admin pages and maybe you are impressed how simple it is. 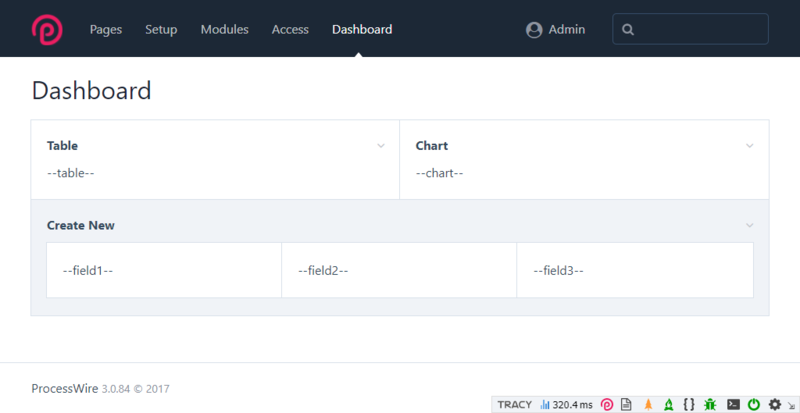 Our next step will show how to build a Module with multiple pages and how to add some common elements like Data Tables. There is also a second way of adding buttons that we will cover next, after this method naming tip below. First we add the chart.js library to the scripts array. 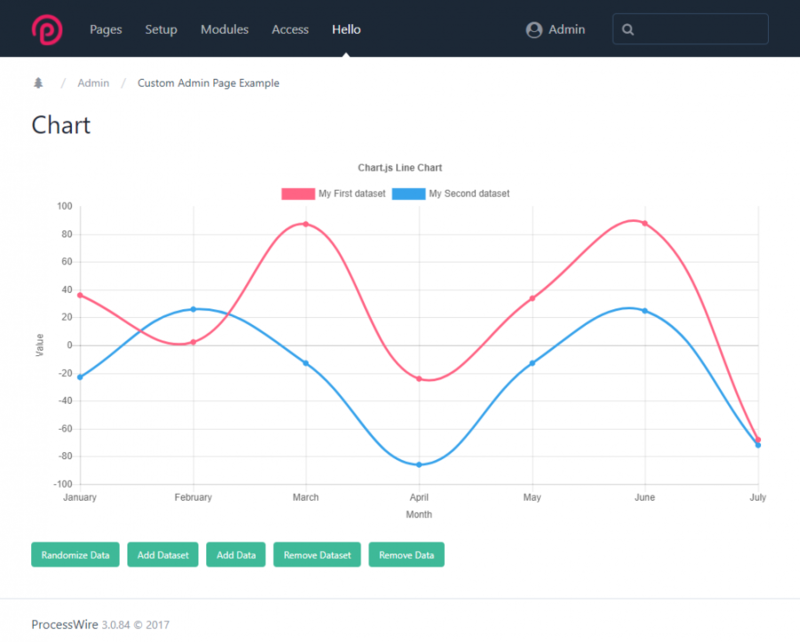 Then we add some utility functions from chartjs, and finally we add our local file. The code from our file chart.js is taken from their samples, unmodified and only wrapped in a $(document).ready() jQuery function. See our chart.js file. Note: if interested in the Skyscrapers profile, you can find the newer version here, but it is just the template files rather than the complete profile. Before we start, we will organize our module a little differently from our other examples. This one is going to be a little more complex so we split everything into seperate files to keep a good overview. 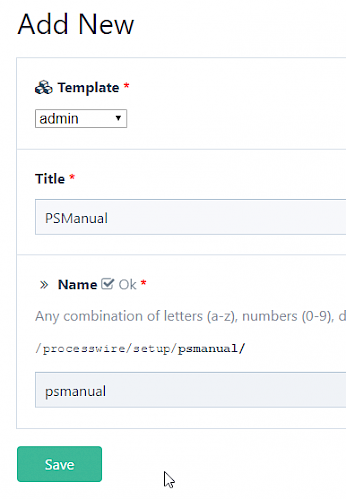 See the ProcessHello module for files and instructions. Whenever we are talking about user input we need a form with some Inputfields [Inputfield modules]. 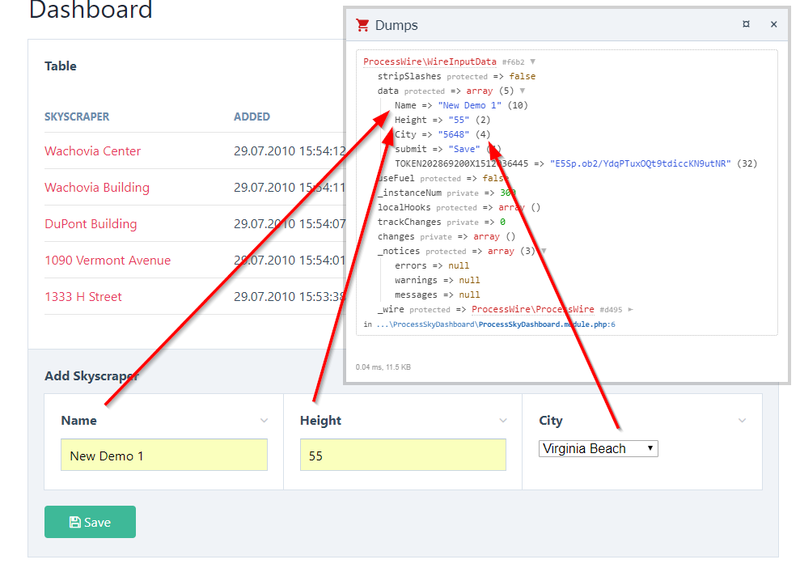 Forms and Inputfields are not only great to handle user input but also to structure your output, as well as separate your code and functionality into several reusable pieces. I'll show you some examples at the end of this section. 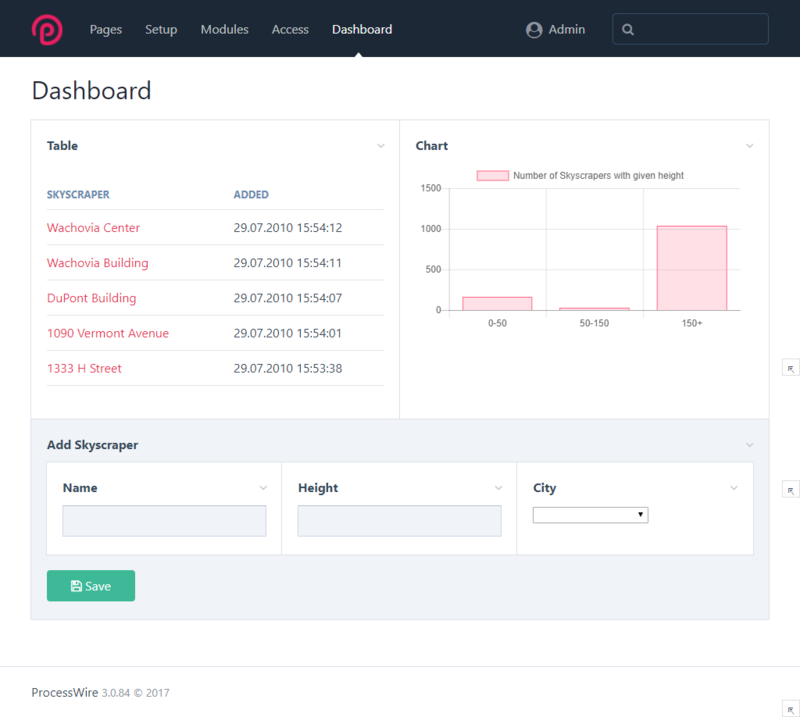 In our dashboard example we also need both structure and user input. 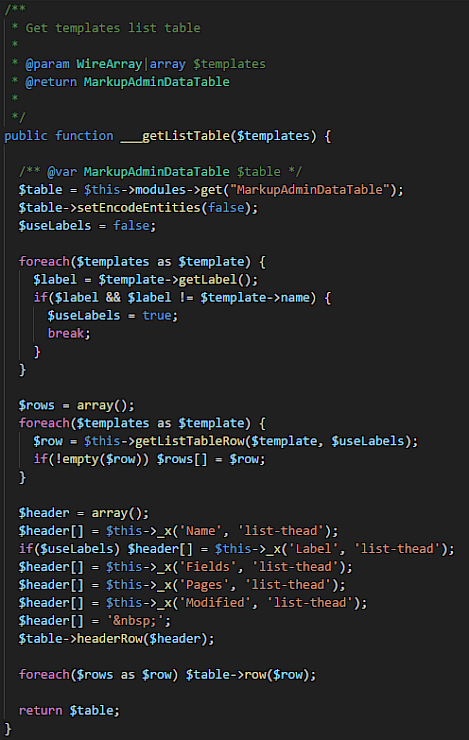 We create a very basic form using the most minimalistic Inputfield modules we have: InputfieldForm and InputfieldMarkup. Please take care whenever you are dealing with user input! You need to sanitize and validate all inputs carefully. The examples are just a quick showcase and not 100% foolproof or secure. 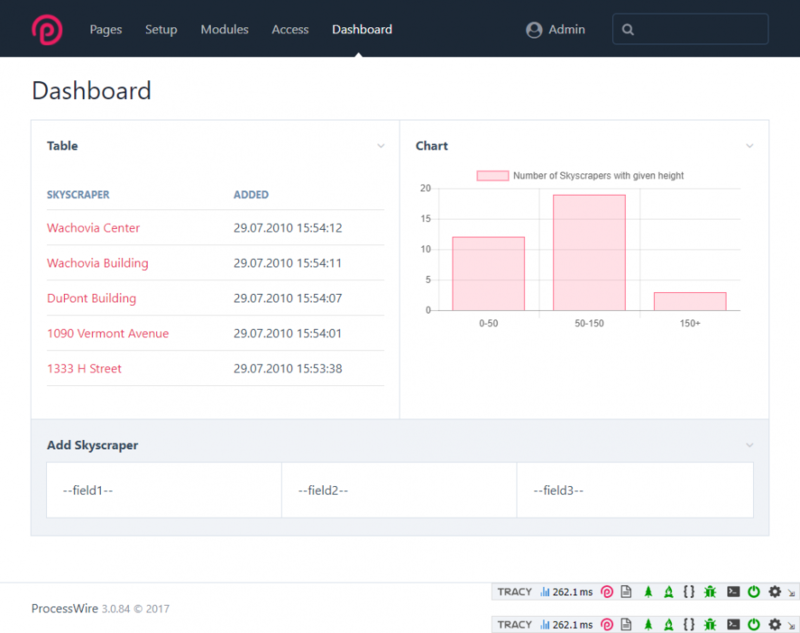 Redirect back to the dashboard after creating the page. Note: setting the action attribute (like above) is only necessary if you are NOT using trailing slashes in the URLs. If you are using trailing slashes for your Process module's URLs, then it's not necessary to set the form action attribute because the default setting is the current directory path. Please note: the above example is not shown in the example files. If you wanted to use this strategy, you'd want to move your InputfieldForm generation code to a separate method (i.e. buildAddSkyscraper) so that it can be called by both ___execute() and ___executeAddskyscraper(). This is the strategy used by most of the core Process modules. Another approach could be to customize the add new page screen via a hook as recently discussed in the forum. Besides the benefit of a better optical appearance, you get some features that are built into PW's Inputfield modules by default. You can group them into fieldsets, create responsive grids by setting the columnWidth property, and you can reload fields by triggering the "reload" event. I'll show you how in this section. Of course this is just a quick example and it does not update the chart. It's just an idea that was requested in the forum and I wanted to show a basic principle how this can be done. Download the latest PW dev version. Download the site profile and place it in your root folder (or subdirectory if preferred). I hope you enjoyed reading this and lost any fear about creating your first Process module. When I started diving into this topic around two years ago I quickly got some really cool results. You can see my custom CRM/Controlling-Office-Management-Tool that I built for a Vienna based company on my (PW powered and ProCache’d) website (in german) or on the processwire forums (in english). Wow, wow, wow! Awesome tutorial. Lots of clarifications and points that make building functionality in the backend so much clearer. Thank you! Is there anyway for panel to automatically refresh/reload the parent page when the panel is closed? For example, if you have a data table that lists pages and you click on that page to edit the page in a panel. After you make your edits and close the panel, you want the data table to refresh with the updated edits. Great post. Thank you Bernhard! This surely will help a lot of the PW folks to get started with Process Module development. This is superb content to learn! I'm grateful for your effort. Awesome post with lots of valuable info.